Marketplaces and prices shown matched UPC number 010343936270 during our search. Versatile - 150-sheet paper capacity, borderless printing up to 8.5" x 11"
The WorkForce ET-3750 EcoTank all-in-one, powered by PrecisionCore, offers revolutionary cartridge-free printing with easy-to-fill, supersized ink tanks. It includes up to 2 years of ink in the box (1). That’s an incredible amount of ink — enough to print up to 11,200 pages (2), and equivalent to about 30 ink cartridge sets (3). Plus, it features auto-stop ink bottles with each color uniquely keyed for easy filling of each tank. And, you save up to 80 percent on ink with low-cost replacement bottles (4). The ET-3750 also offers a 30-sheet ADF, fast auto 2-sided printing, borderless printing up to 8.5" x 11", a 2.4" color LCD and easy wireless printing from tablets and smartphones (5). 1. Based on average monthly print volumes of about 300 pages. 2. Included ink bottle yields based on the ISO/IEC 24712 pattern with Epson’s methodology. Actual ink yields will vary considerably for reasons including images printed, print settings, temperature and humidity. Yields may be lower when printing infrequently or predominantly with one ink color. All ink colors are used for printing and printer maintenance, and all colors must be available for printing. For more information, visit our official site. 3. Equivalent cartridge sets estimate based on print yields of the included Black and color ink bottles as compared to Epson standard-capacity ink cartridge sets for similarly featured cartridge printers as of March 2017. 4. Savings comparison based on the purchase cost of replacement ink bottles and the cost of enough cartridges to achieve the total page yields of the bottles using the manufacturers’ online prices and yields for the highest-capacity cartridges for the best-selling, similarly featured consumer inkjet printers priced at $499 or less per NPD, July 2016. Actual savings will vary based on print tasks, print volumes and usage conditions. 5. Most features require an Internet connection to the printer, as well as an Internet- and/or email-enabled device. For a list of Epson Connect enabled printers and compatible devices and apps, visit our official site. 6. Wi-Fi CERTIFIED; level of performance subject to the range of the router being used. Wi-Fi Direct may require printer software. 7. 12 months of standard limited warranty or 50,000 plain paper sheets (whichever happens first). For an additional 12 months (total of 24 months or 50,000 plain paper sheets, whichever happens first), register your product and use Epson genuine ink bottles. See Limited Warranty for details. 8. ET-2500/2550/2600/2650/2700/2750/3600/3700/3750/4500/4550/4750/16500 included ink bottle yields based on the ISO/IEC 24712 pattern with Epson’s methodology. ET-7700/7750 included ink bottle photo yields are significantly lower and are based on the ISO/IEC 29103 pattern with Epson’s methodology. WF-R4640 included ink pack yields are estimated based on ISO/IEC 24711 test in Default Mode printing continuously. Actual ink yields will vary considerably for reasons including images printed, print settings, temperature and humidity. Yields may be lower when printing infrequently or predominantly with one ink color. All ink colors are used for printing and printer maintenance, and all colors must be available for printing. For more information, visit our official site. 9. Based on average monthly document print volumes of about 150 pages (ET-2500, ET-2550, ET-2600, ET-2650, ET-2700, ET-2750, ET-4500), 300 pages (ET-3600, ET-3700, ET-3750, ET-4550, ET-4750, ET-7700, ET-7750, ET-16500), and 800 pages (WF-R4640). 10. For convenient and reasonable recycling options, visit our official site. 11. SmartWay is an innovative partnership of the U.S. Environmental Protection Agency that reduces greenhouse gases and other air pollutants and improves fuel efficiency. Includes enough ink to print up to 14,000 pages black/11,200 color (2) — equivalent to about 30 ink cartridge sets (3). Efficient — 30-sheet Auto Document Feeder; fast auto 2-sided printing. Versatile — 150-sheet paper capacity, borderless printing up to 8.5" x 11". Cartridge-free printing - comes with up to 2 years of ink in the box1 Includes enough ink to print up to 14,000 pages black/11,200 color2 - equivalent to about 30 ink cartridge sets3 Save up to 80 percent on ink with low-cost replacement bottles4 - plus easy-to-fill, supersized ink tanks Efficient -- 30-sheet Auto Document Feeder; fast auto 2-sided printing Versatile - 150-sheet paper capacity, borderless printing up to 8.5" x 11" Powered by PrecisionCore printing technology - delivers laser-quality black text Large 2.4" color LCD - easy setup and navigation Complete wireless solution - easily print from iPad, iPhone, Android tablets and smartphones5; includes Wi-Fi Direct6 plus Ethernet Exclusive auto-stop ink bottles - uniquely keyed for easy filling of each color Product protection you can count on - 2-year limited warranty with registration7Hands-free voice-activated printing** - ask Alexa to print a variety of creative projects and everyday documents, including your to-do and shopping lists. Find out more!Eco Features Save up to 50 percent of your paper supply with automatic, 2-sided printing ENERGY STAR qualified RoHS compliant Recyclable product8 Epson America, Inc. is a SmartWay Transport Partner9 Better Products for a Better FutureFor more information on Epson's environmental programs, go to www.epson.com/environment. 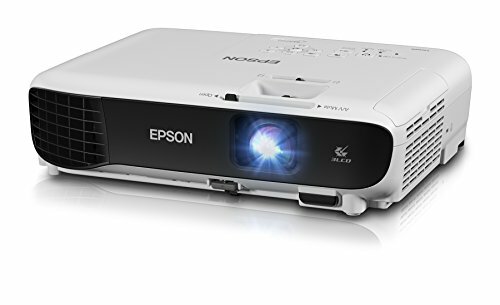 Epson WorkForce ET-3750 EcoTank All-in-One Supertank Printer. Product protection you can count on - 2-year limited warranty with registration. 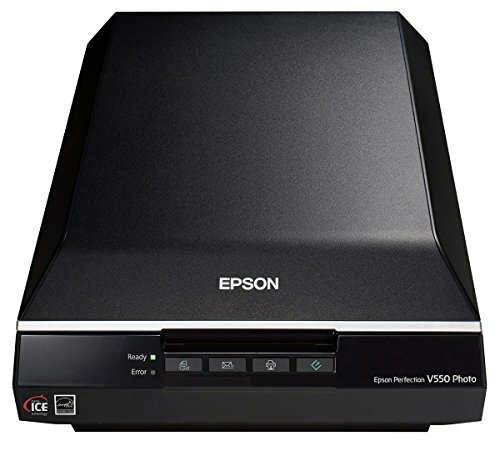 Take on printing, copying and scanning tasks using the same device with this all-in-one unit. 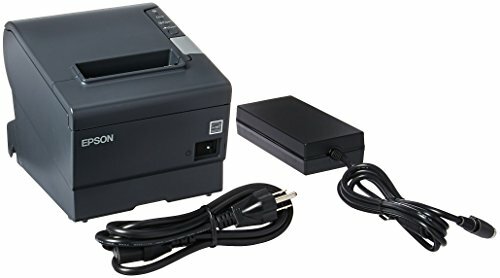 The printer features built-in wireless connectivity and Wi-Fi Direct for simple networking, and a variety of mobile printing options make it easy to operate directly from a smartphone or tablet. Built-in wireless (802.11b/g/n) connection allows cable-free use. 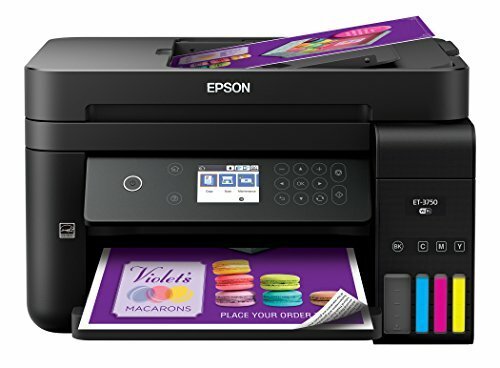 Features Epson Email Print, Epson Remote Print, Epson iPrint(TM) app, AirPrint(R), Google Cloud Print(TM), Android Printing, Fire(TM) OS printing and Mopria(R) Print Service for a vast array of mobile printing capabilities. Wi-Fi Direct enables file sharing through a wireless network. Prints up to 15 pages per minute (ppm) in black and up to 8 ppm in color. Up to 4800 x 1200 print resolution for crisp images and text. Copies up to 11 cpm (copies per minute) in black and up to 5.5 in color. Color flatbed/ADF scanner offers a scan area up to 11.7in. x 14in.. Scan resolution up to 9600 dpi interpolated. Scan to Computer and Scan to Cloud functions make it easy to move scanned images onto your devices. 4-color, drop-on demand MicroPiezo(R) inkjet technology. Supersized, easy-to-fill ink bottles handle heavy-duty, high-frequency printing applications. Compatible with plain paper, photo paper and presentation paper. Also works with envelopes. Automatic 2-sided printing saves paper and money. 150-sheet paper capacity is ready to take on large jobs. Up to 5,000-page duty cycle. 2.4in. color LCD helps you view current and upcoming tasks with the touch of your finger. Compatible with PCs and Macs. Backed by the manufacturer's 2-year limited warranty.